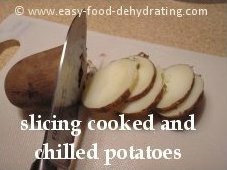 Here are a Few Easy Ways to Dehydrate Potatoes! 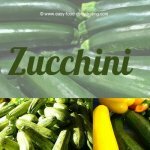 Dehydrating potatoes can be done by either using fresh potatoes, or you can cheat by using frozen (diced) hash browns, or grated hash browns – now that's easy! 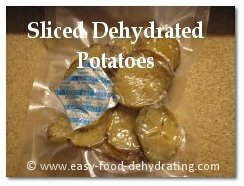 Potatoes are everyone's favorites and I'll show you how they can be easily dehydrated from pre-cooked, sliced potatoes! The hash browns are great in vegetable soups, and the sliced potatoes make a mean potato and bacon hash! TIP: if using frozen hash browns, drop the frozen unopened bag on the kitchen counter-top a few times to break up any clumps. If clumps persist, run the clump under cool running water for a few seconds – that should do the trick! By the way, potatoes are loaded with a range of vitamins: vitamin A, vitamin C, and Choline, followed by Niacin, Thiamin, vitamin B6, Pantothenic Acid, and Betaine. Trace amounts of vitamin K, and Folate. Minerals to be found in potatoes are Potassium, followed by Phosphorus, Magnesium, and Calcium. There are also trace amounts of Iron, Zinc, Manganese, Copper and Selenium. Potatoes contain Omega-3 and Omega-6 fatty acids too. 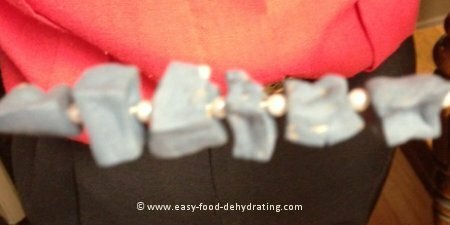 Dehydrating Potatoes ~ The EASY Way! 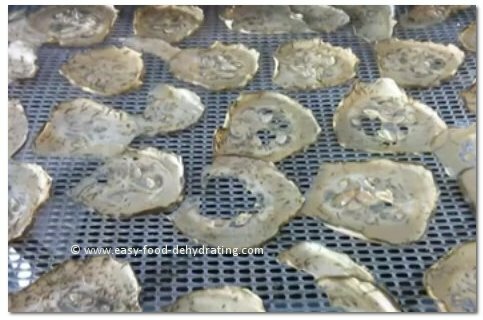 Let's get busy dehydrating potatoes! If using frozen hash brown potatoes, simply ignore steps 1, 2, and 3. Potatoes will be leathery and/or brittle when fully dried. Drying time for potatoes: between 6-14 hours. Here is another way to store potatoes: freeze them. 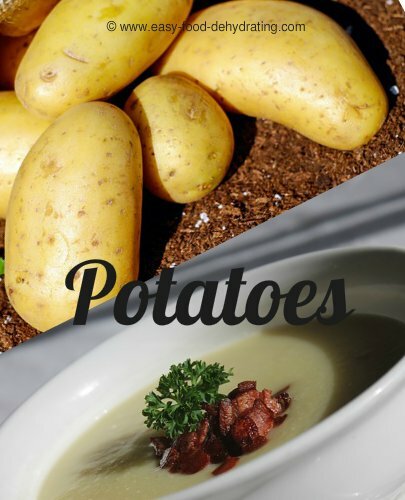 Take a look at Judie's site, best-potato-recipes.com, which is chock full of great potato soups, casseroles, grilled potatoes, and of course – mashed potatoes! Superb comfort food, and a bargain to boot. "Started batch number four of potatoes this morning. Things are running quickly and smoothly now that I have the routine down. Still forget to start heating the blanching water first though, it takes about 20 minutes on my stove. I'm doing sliced raw potatoes. Anyway in my mind it takes longer to peel and slice potatoes than to get the water boiling. In reality it's only a few minutes of prep, then potatoes are ready and the water isn't. Oh, what a journey these 99 cent bags of potatoes have taken me on!" Like I said, tasted pretty good but as far as keeping them for a long period, more steps will have to be made."